Slips and falls can be fatal in the workplace. In 2017, falls were the second highest cause of occupational death according to the U.S. Department of Labor. They accounted for 887 fatalities on the job. An estimated 25 percent of all disability claims per year, amounting to more than $25 billion, result from falls. Preventative measures for spill-related falls can help protect workers from injury. They can also limit occupational health care and rehabilitation expenses. Secondary containment captures and prevents spills from spreading. Since it confines the product to the secondary containment area, it also makes clean-up easier and helps prevent spill-related falls. Accumulation centers or IBC stations capture leaks from drums or IBCs. Rigid-Lock QuickBerms® form temporary spaces for storing larger numbers of drums or other containers. RELATED ARTICLE: Spill Containment – Is Your Workplace Prepared? There is always a chance of spills when dispensing liquids, but precautions can limit the risk. Use approved self-closing faucets so that a distraction from the dispensing operation won’t result in an overfill and spill. Place spill containment drip trays underneath the dispensing faucets to catch leaking drops. Use approved transfer pumps for pumping from vertically stored drums. Approved pumps have high quality seals and are less likely to leak or fail during dispensing. Use high-quality drum handling equipment to move or transport drums. Steel drums are heavy. A full 55-gallon drum can weigh over 2,000 pounds, though most weigh somewhere between 400 to 800 pounds. They are also awkward to move. The drum’s contents may shift during a move, which could cause an overbalance. If it starts to fall or tip, the natural reaction is to try and catch it. But the weight when full makes this almost impossible and may result in serious injuries. It may also cause a spill or damage to the drum, which could be costly. To reduce the risk of injury or spills, only high-quality equipment designed for handling the weight of your drums should be used. Always operate according to the manufacturer’s instructions. Use drum cradles for moving horizontal drums or drum dollies for vertical drums. Tong-styled drum lifters are suitable for lifting and moving 55-gallon steel drums with a forklift truck. Spill containment caddies feature an ergonomic tilt/stop design. This allows a single person to transport full drums without the risk of spills – especially important for spill containment when moving dangerous chemicals outdoors. 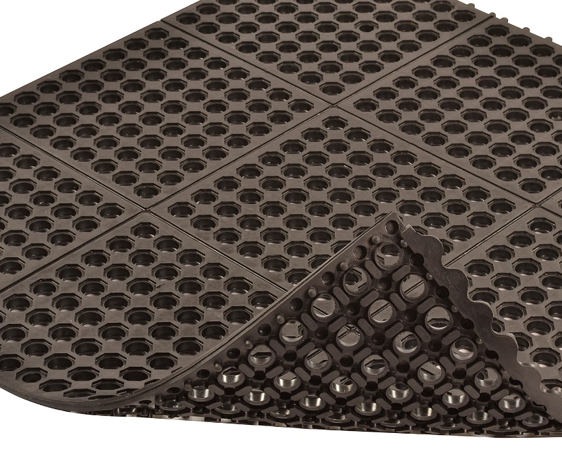 Anti-slip industrial floor mats like the Notrax 550 Cushion-Ease® offer excellent drainage and aeration to leave a clean, dry work area. Use funnels for transferring liquids between containers. Pouring from one container into another without using a funnel may cause spillage. Funnels direct the poured liquid into the receiving container without spilling. In vertically stored drums, use polyethylene pop-up gauges to indicate when the drum is almost full. Minimize the chance of slipping by using industrial floor mats. Anti-slip, anti-fatigue floor matting helps prevent safety hazards such as falls in high-traffic areas. Designed with large holes for drainage and aeration, mats increase traction in wet areas while providing a clean, dry workplace. They also help prevent spill-related falls and increase the comfort level of your employees, which subsequently increases productivity. Make spill kits or absorbents available all the time. The first response to a spill is critical to prevent it from spreading and to contain the risk. Choose the appropriate spill containment or absorbent for the chemicals and have them available at storage and handling sites. Train workers how to use absorbents to clean up spills and proper disposal methods. At Justrite, everything starts with safety. We help our customers implement systems and solutions for avoiding and containing spills to reduce the risks of spill-related falls and injuries. Our products are made to work hard and built to last. Contact Justrite for expert advice about your application or find out more about our spill containment and environmental products here.